In 1978, Ira Levin’s famed play Deathtrap started its four-year Broadway reign combining the nail-biting tension of a thriller with carefully timed witty repartee to lighten the mood. Levin’s play later moved to the screen in 1982 in a film of the same name starring Michael Caine, Christopher Reeve, and Dyan Cannon, although the final resolutions of play and movie diverge from one another. There are even passing references to both Michael Caine and the movie Sleuth in the play’s script foreshadowing Levin’s desire for the screen adaptation. Hillbarn Theatre continues its 72nd season with this tried and true bastion of the genre. Given this is a mystery/thriller, it won’t do to divulge too much of the plot lest the surprise elements whither and lose their impact, but the scene can be set. Meet Sidney Bruhl (Paul Stout), a playwright specializing in thrillers, specifically murder mysteries (many of which have run on Broadway), who has hit a dry patch. He hasn’t written a successful play in years and is relegated to delivering seminars on the secrets of his craft to eager, up-and-coming playwrights at the local college. We gather his wife Myra (Paige Cook) had money, but because of his string of failures, the funds are running low, and he’s becoming a bit desperate. As the story opens, Sidney is telling Myra about a play he received in the mail from Clifford Anderson (Adam Magill), one of the students from his seminar. Sidney says he is very impressed with the play entitled Deathtrap, a Thriller in Two Acts and thinks it would be a hit; he also wishes it had been his idea. Myra encourages him to reach out to potentially collaborate with this talented young colleague, and with her help, Sidney takes the leap, swallows his pride, and offers Clifford the opportunity to join forces with him. Along the way, Helga Ten Dorp (Monica Cappuccini), a Danish psychic who happens to be renting the house next door to the Bruhls, and Porter Milgrim (Richard Albert) the Bruhls’ lawyer, pop in to join the fun. Hillbarn’s production has a number of things to write home about, first and foremost is the gorgeous set designed by R. Dutch Fritz. The remarkably spacious performance space sports what appears to be a converted stable, two stories high. Upstage left, is a staircase to the upper level complete with a lovely wooden landing protected by a railing. Upstage center is a two story wall covered with an impressive display of antique battle implements including various spears, broadswords, daggers, a mace and shield, handcuffs, numerous firearms, an axe, and a crossbow. Downstage right, is a fireplace, nicely appointed with a realistic looking flame of light that is boosted on cue when anything is dropped into the fire. The couch, desk, and chairs all add nice finishing touches as do the curtained French doors stage left and curtained windows downstage right and left. The coat rack under the landing on the way to the unseen front door and kitchen is functional, and to finish it all off, a “candle” chandelier hangs above the middle of the room. The entire set brings the audience into Sidney’s studio. Two props stand out. One is the Rubik’s Cube on Sidney’s desk. Though not actually in the script (and not widely distributed until 1980), everyone in the cast picks it up at some point during the play. The other prop is the phone. The play takes place in 1978, but Sidney has a touch tone phone on his desk. Given his fascination with antique armaments, technology that didn’t become commonplace until the 1980s seems anachronistic. The technical aspects of the play are extremely well done. The lighting and sound effects designed by Valerie Clear are striking, from the lightning and thunder, to the flickering house lights, together providing a realistic balance. The exception on opening night was the abrupt blink from full house to blackout and then to low light for the curtain speech rather than the usual fade at the top of the show. A particularly nice sound consideration is the choice of music used before the show and for the scene changes. A Baroque “cat and mouse-like” soundtrack much like that used in the movie Sleuth is featured. Director Karen Byrnes has staged an interesting though slightly under tempo production. All of the elements are there, but the performances haven’t completely gelled yet. That’s not to say that there aren’t some wonderful moments, particularly the humor infused segments, but it takes a while to setup the storyline in Act 1. Also, “fact” isn’t clearly differentiated from “fiction” between the play and the “play within the play” sequences. Some of this may be the result of the fight choreography which generally reads as pure camp save for one later scene that’s quite realistically executed. As for the characterizations, Albert’s Milgrim is the most believable. Although a minor, yet pivotal role, Albert’s lawyerly carriage works. His calm manner and reasoned delivery balance some of his fellow castmates’ zaniness. In another supporting role, Cappuccini’s Helga Ten Dorp is written and played for laughs. She’s the perfect, yet charming, caricature of a European psychic, eerie predictions and all. Cook’s Myra is steady and appropriate, although her scene that relies on intense physicality isn’t completely believable. Then we come to Stout and Magill as Sidney and Clifford. Magill captures the exuberance of the youthful and eager Clifford, but he needs a bit more contrast between the initial shy student and his later more confident persona. Also, his laugh seems a little too girlish, although there are moments when it appropriately borders on maniacal. Stout is a little stilted. He never completely loses his affected delivery and never fully extracts himself from the “play within the play” even when it seems as though he should. He does, however, have wonderful comedic timing and delivers his droll one-liners beautifully. 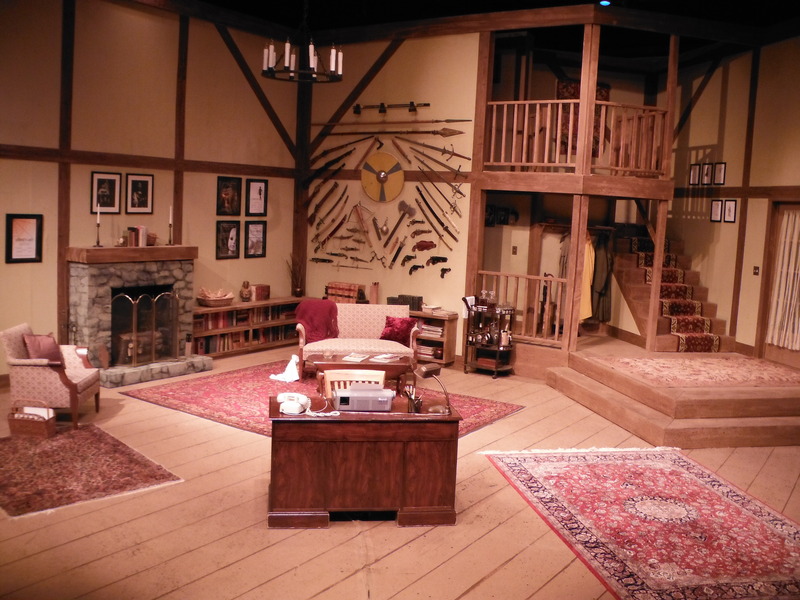 Though this production starts out slowly, Hillbarn’s Deathtrap still provides an enjoyable evening’s entertainment with enough twists and turns to keep it interesting. When: Fridays – Sundays through 4 November 2012. See http://hillbarntheatre.org/deathtrap/ for more information or to order tickets. actually touch tone phones were in households in 1963. and since Sidney was a world famous play write he would have some state of the art trinkets…..a touch tone phone could be one. AT&T Touch-Tone Telephone, 1963. Early Touch-Tone sets had only 10 buttons. AT&T added the * and # keys in 1968 for use in advanced services. Thank you for your comment and kind words regarding my review. I was aware that touch tone phones have been available in some fashion since the early 1960s, but they weren’t widely available or even supported until much later. I was also aware that many areas didn’t have tone service available, so most early touch pad phones had a switch to choose either pulse or tone so that users could enjoy the convenience of the touch pad even without tone service. In many areas, when tone service became available, it was considered an added service and users were charged an extra fee. You bring up a good point though that given Sidney’s status as a successful playwright, he well may have had some less common personal items. As mentioned in my review, to me given his fascination with antique armaments, the advanced technology seemed out of place.